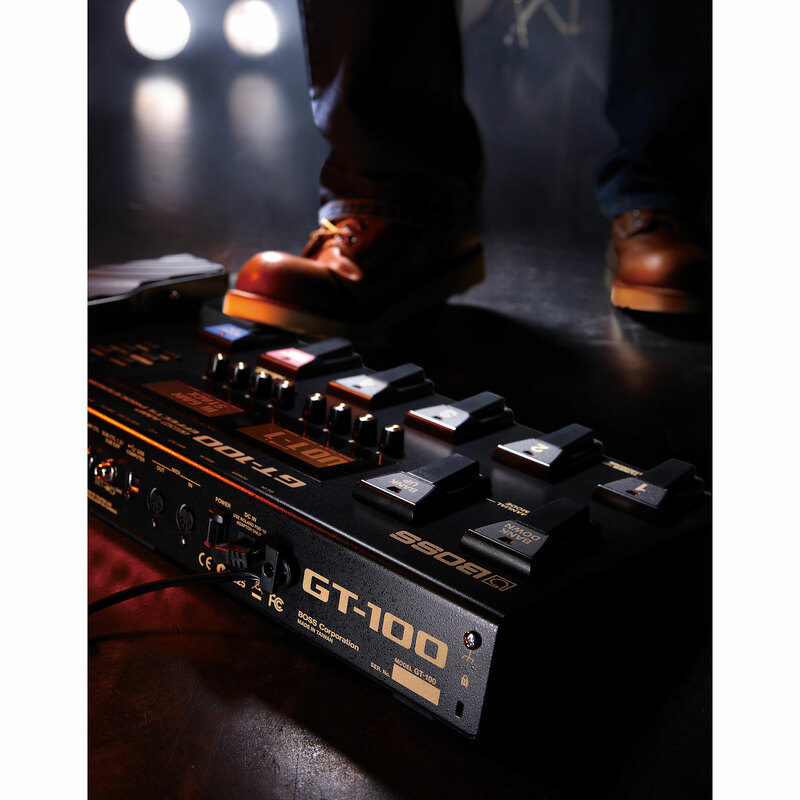 The Boss GT-100 amp effects processor features COSM amp modelling that models vintage amp tones and delivers never before heard tones. A new dual LCD display offers simple and intuitive operation with direct access to all parameters. 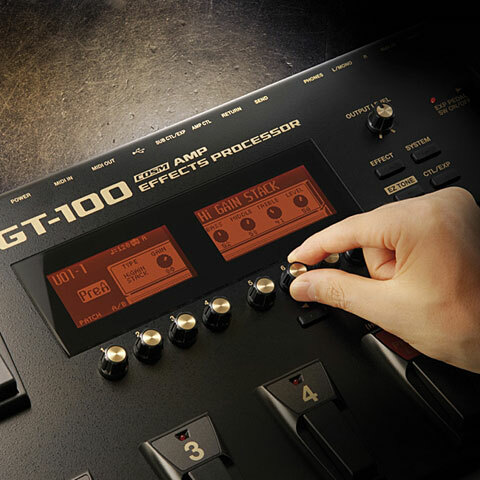 Other features of the Boss GT-100 include an improved EZ Tone feature with a graphical TONE GRID for constructing new patches and customization options. 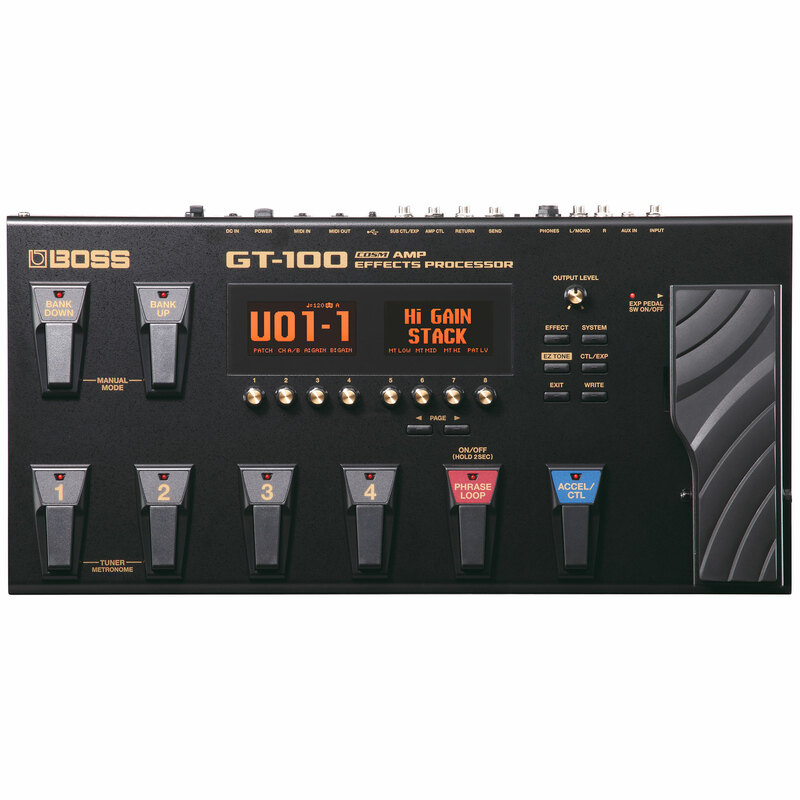 Boss has fitted the GT-100 with easy to operate dual LCD eight-knob user interface that provides quick access and intuitive control with no menus to navigate. Every parameter is always available for instant adjustment. Tone customization functionality has been improved with all amps, patches, and overdrive settings which can be created from scratch and/or customized with the user-friendly graphical Tone Grid. 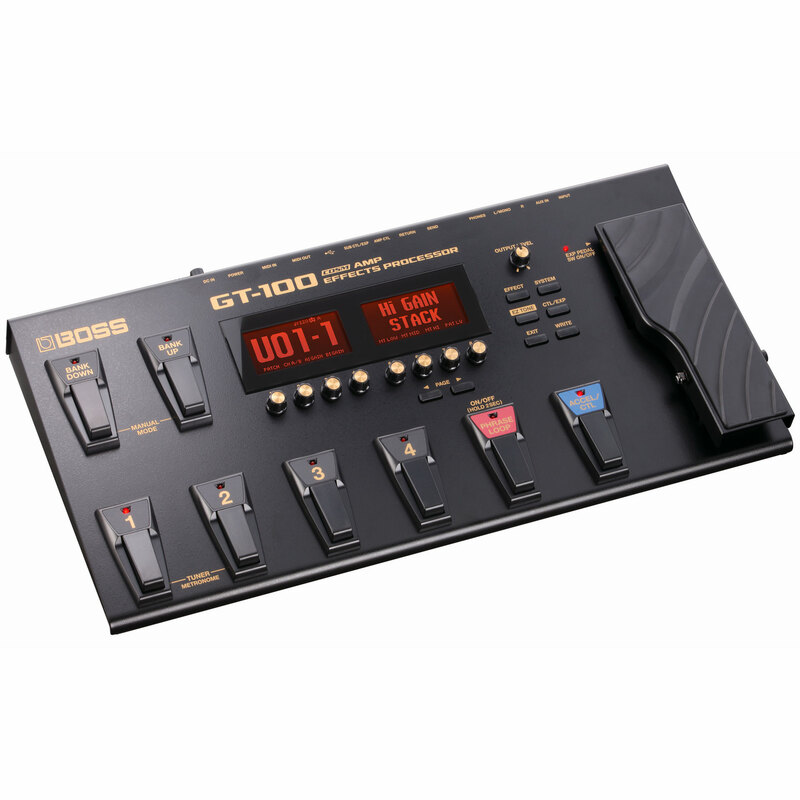 The Boss GT-100's Accel pedal is able to control multiple parameters at once, as well as time-variant effects such as Twist, Feed backer, and S-Bend. 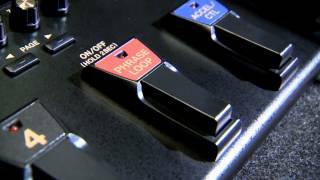 Use the pedal to create combinations of parameters, interacting in real time. 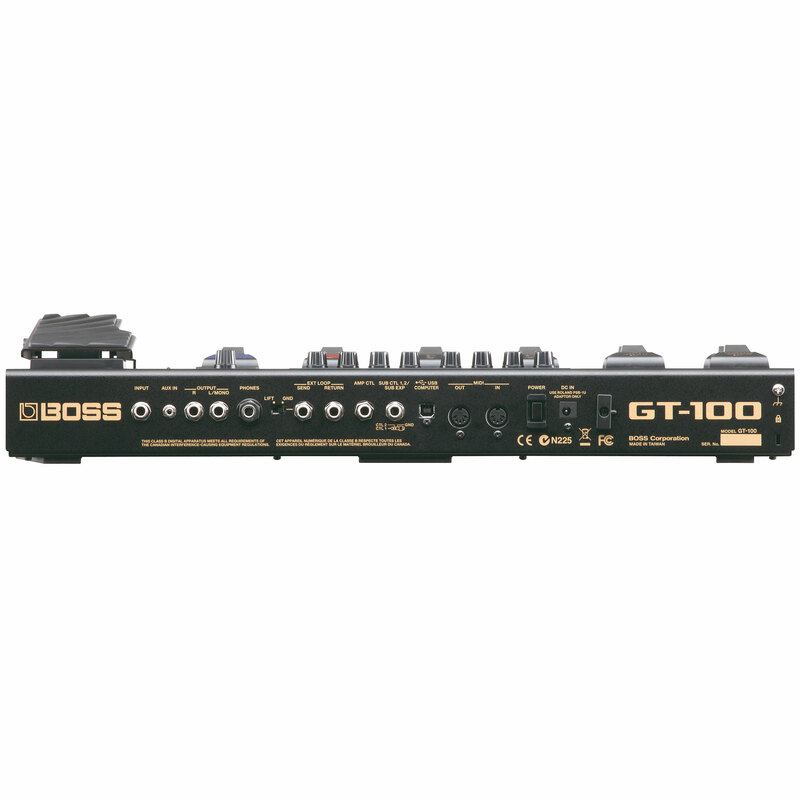 The Boss GT-100 includes another new feature: A/B Channel Divide. With it, you assign different amps and effects to each channel and divide the signal by dynamics and by frequency. Each channel drives its own effects and amp settings. Assign lead tones to the mid-to-high pitches, and gritty, cutting tones to your lower notes. Brilliant has most of the sounds and effects I need only problem is sorting out Boss Tone central as I can't open the editor!!!!? Great Fun great service from Musik Produktiv prompt delivery !!!!! The BOSS GT-100 is an excellent guitar effects processor, but I prefer the BOSS GT-10 because it has all of the effect buttons (Compressor, Preamps, EQ, FX1, FX2, Chorus, Delay, Reverb, etc.) right on the front of the unit so I can instantly see what effects are on/off, and I can instantly select the effect I want to edit. I also prefer having the CTRL1 and CTRL2 pedals on the BOSS GT-10 vs. the Loop and Accel pedals on the BOSS GT-100. Most of the effects (including the Graphic and Parametric EQ's) appear to be the same in the BOSS GT-100 as in the BOSS GT-10 as well; I was hoping for a 16/32/64/128-band Graphic EQ and a Parametric EQ that would allow me to adjust at least 20 or more individual frequencies (at 100Hz increments; rather than skipping every 1000Hz or so). The BOSS GT-100 does not have all of the same amp types and so if a person transfers BOSS GT-10 patches into the BOSS GT-100 the patches will not sound the same; I highly recommend that Manufacturers who make guitar effect processors include all of the same effects (and parameters) in the new/future guitar effect processors as the older units had; By doing so awesome guitar sounds (called patches) will be able to be transferred onto the new units and years from now there will be thousands of awesome sounding patches that can be used in old and new guitar effect processors. It always comes down to a person wanting great sounds (called patches); And if a Manufacturer does not include all of the same effects (and parameters) as the older units, then all the awesome guitar sounds (called patches) become useless in the newer guitar effects processors; and the process of making great sounding patches starts all over again! So it is very important that guitar effect processor Manufacturers include all of the same effect (and parameters) from the older units into the newer units and make sure when the patches are transferred they sound 100% (not 99%) the same! This item was given an average rating of 4.6 out of 5 stars. In total, 2 reviews were submitted. The comments are not the opinion of Musik Produktiv, they are the subjective opinions of our customers. 26 ratings exist without a text or these reviews are written in another language.